Today is the official UK release date of the Oxford Companion to Beer, the latest in a long-running series of intended reference materials on subjects from Aboriginal Art to World Sports. As anyone who has searched for beer-related gifts knows, there’s no shortage of books out there – particularly if shopping online. Many are about specific topics, and there are plenty of glossy, well-shot picturebooks of the ‘X beers to try before you Y’ variety. The Oxford University Press has the cachet in this regard, to produce a one-stop, catch-all compendium of everything to do with the world’s favourite alcoholic beverage. 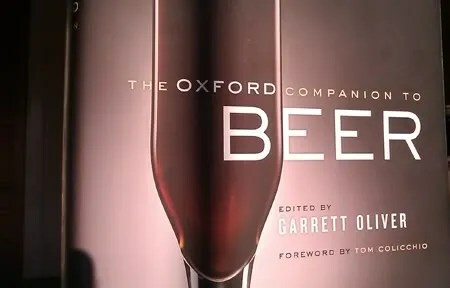 With their pendulous new Oxford Companion to Beer, edited together by Brooklyn Brew Master Garrett Oliver, they have very much laid down the cornerstone in this regard (have I given enough of an impression of its size yet? With over 1,100 entries inside, the book is a meaty two inches thick). Clearly, there’s no way it can be read through other than in a piecemeal fashion – dipped into at random, or consulted like an encyclopaedia. With an astonishing 166 contributors, this book is very much meant to be the definitive work on the subject. But there’s a problem. Collective works have an inherent danger – the book, and the reputations of the editor and publisher – stand or fall based on the copy filed by the other authors. Putting my cards on the table straight away – clearly, I’m not a beer historian. I know about beer, I know what I like, and I know how to combine those two things in writing. As editor-in-chief of this website, I’m fully aware that anything written by the other BeerCasters will reflect on my reputation*. As such, I make sure to check all the facts on anything written by the others**. So for 1,100 entries, the wavy red lines on Garrett’s spellchecker must have been seared into his eyeballs. Soon after OUP began sending review copies out – and many thanks to Kate at OUP for ours – the first few websites to feature the book gave it above average reviews. This was my initial opinion too – this thing feels right – it looks the business, it has numerous jargon-busting pages on the machinations of brewing, and the individual characteristics of different hops. The entries written by Garrett himself have that languid, wordy style of his – which is how I imagine he talks. But then the historians got hold of the book. A few inconsistencies came to light; someone got the Anglo Saxon invasion of Britain in the wrong century or something – not a massive problem, really. Although the OUP crest is on the spine, this book very definitely has an American backbone. However, very soon the two beer historians I do rate highly – Martin Cornell and Ron Pattinson – really cast serious doubts, with Martin even questioning whether it’s a “Dreadful disaster”. Simple inaccuracy is one thing, but the level of mistakes that Martin and Ron found in a few entries is pretty astonishing. Ron’s post on Old Ales savages the entry written by Horst Dornbusch by contradicting Horst’s statements with archive photographs of brewery ledgers. This is the unfortunate issue with the book – as a textbook on brewing fundamentals, it seems fine. But the sections that can be argued with are being questioned intently. Who to believe? Well, – I tend to believe the guys who thumb through dusty records in municipal buildings. The question should really be ‘What to believe?’ A quick straw poll of BeerCasters in the pub last Friday (no writing from them required; guaranteed response) had an even split – either this is just academics nit-picking, and the general facts are good enough, or once you know something’s wrong, you can’t trust any of the rest of it. The scope of the Oxford Companion to Beer was enormous – there’s nothing wrong with 1,100 entries on a subject. But if a few are shown to be wrong, for people like myself who (on certain subjects) don’t know what we don’t know, can it be taken as the ultimate resource? Should they have let Martin and Ron handle British beer history? The book would have been longer, but it might have been worth it. *By the way guys, if any of you want to write anything – just let me know. I have no reputation to speak of. Can we just scotch one growing myth? I didn’t say it WAS a disaster, I said a very quick glance found enough errors to suggest that from a brewing history point of view it might be. Thanks for the nice words, btw. Thanks for the comment Martin – I’ll amend the text, I guess the ‘dreadful disaster’ quote was more of a question than a statement…an important difference!